Most of the time, I like to eat healthily. (Yes, cake can be healthy...) However, there are times - like tonight - when I can't really be bothered cooking when I get home (shock horror!). Perhaps it's because I've had a rubbish day at work, perhaps it's because I'm home late (like today), or perhaps it's just because of no real reason... Either way, sometime I just want a big bowl of easy, not particularly healthy food. I was going to blog about the "Moreish Meze" meal from Starbucks, as I has planned to buy one to try on the way home, as I knew I would be home late. No such luck - they had none left! So then I was going to give you a recipe for the healthy lunch I'm throwing together to take to work tomorrow. But I don't feel like doing that today (you can have it tomorrow) - today, I feel like showing you some vegan junk food and dispelling the myth that everything vegan is healthy. This most certainly wasn't. 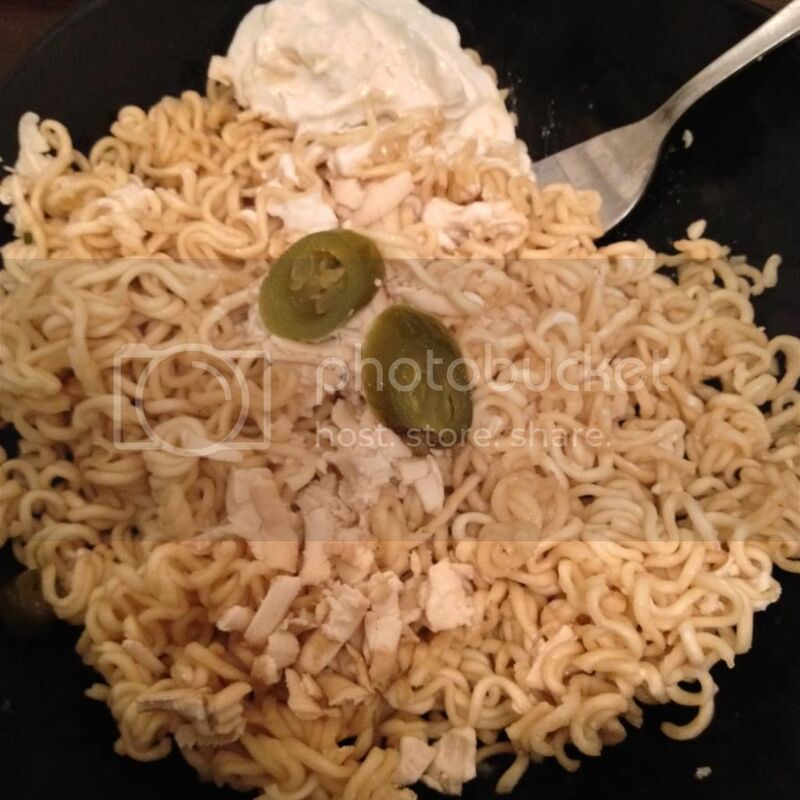 Yup, that's a huge pile of suitable-for-vegans instant noodles, sprayed with liquid aminos, topped with vegan "cheese" (mozzarella style by Sheeze... I was pretty disappointed with it and wouldn't recommend it), vegan mayo (YUM!) and a couple of jarred jalapenos to, you know, add a bit of veg (?). To be fair, everything else I've eaten today has been super healthy and I did a workout at lunch time so if there's a time when I'm allowed to eat junk, I think this is it!